Card counting systems are used mainly by professional players as they are considered to be strategies which are more complicated and advanced. However, because they grew in popularity so much, nowadays there are many methods which have been especially designed to be both simplified and efficient and therefore, suitable for beginners. It has never been so accessible to learn a card counting system and become a proficient Blackjack player. All that it takes is to be willing to invest a lot of time and efforts and strive for improvement every time. Some card counting systems are harder to learn than others but in return, they provide players with extremely accurate information about the cards. The Wong Halves system is famous for its high level of difficulty and complicated plan of assigned point values. However, if players manage to grasp its main principles and apply them when needed, they can be sure that their edge over the casino will be extremely high. This system shouldn’t be used by inexperienced card counters as keeping tracks of the cards according to its assigned values is a very challenging process which requires solid knowledge about the basic card counting systems. The Wong Halves system was introduced by John Ferguson, commonly known in the gambling world under the name of Stanford Wong. This method grew popularity significantly due to his successful book Professional Blackjack, published in 1975. Mr Ferguson is one of the most recognised blackjack players worldwide as he managed to come up with one of the most accurate strategies of all times. His works were influenced by the famous book Beat The Dealer by Edward Thorp which greatly contributed to the creation of his own strategy. As already mentioned this system should be used by advanced players who have already mastered a basic card counting system such as Hi-Lo or K-O. The reason why is that the Wong Halves’ level of count is three which means that it is one of the most complicated strategies ever made. What makes it different from the rest of the card counting methods is that it assigns point values to some of the cards using fractions. Understandably, the counting process is much more difficult to conduct as it requires a lot of concentration and more advanced mathematical equations. The Wong Halves system is a balanced one and as such, it requires the conversion from running count into true count. Calculating the true count comes on top of keeping track of the cards and most times this kind of multitasking can be a really challenging task which is the reason why even advanced players hesitate to use it. However, if applied correctly it provides them with extremely accurate information and it significantly increases their chances of winning. 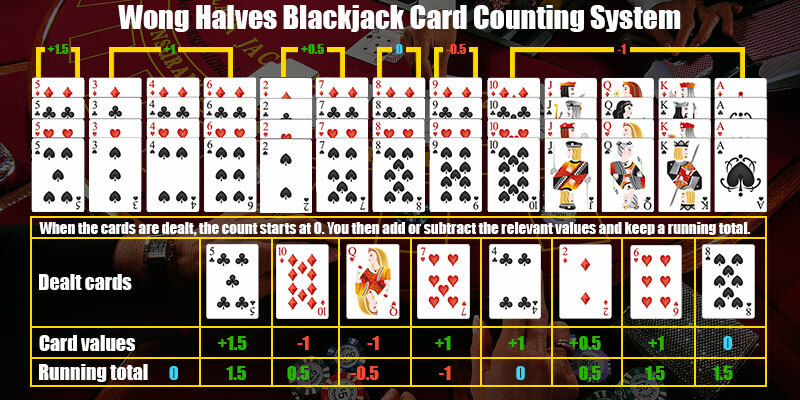 The reason why Wong Halves is considered to be more difficult than the rest of the card counting systems is that it uses an elaborate plan. As already indicated, the assigned point values to some of the cards are in fractions instead of whole numbers. This requires more detailed calculations which many players are unable to conduct in the noisy, full of distractions casinos as they lack the needed concentration as well. The Wong Halves system has the following plan: ten, ace and all of the face cards are counted as minus one, two and seven get one half, three, four, six receive a value of one, five gets one and a half, eight is counted as zero and nine as minus one half. This strategy requires a lot of concentration and efforts in order to be applied correctly and it is highly recommended to be practised somewhere else first prior to using it in the casino. After all, players should bear in mind that every wrong move and decision at the table will most likely cost them money and if they want to make the most of every game, they need to be fully prepared in advance. On the one hand, this system can be really beneficial for the players as its betting correlation has the impressive 0.99 points out of 1.00. This is a clear indicator that Wong Halves is a method which is extremely efficient and accurate at making predictions how favourable the upcoming cards are for them. It is a system which significantly increases their chances of gaining advantage over the casino on the condition that it is applied correctly. On the other hand, even though this system has proven to be one of the most accurate ones that has ever been developed, players need to take into the fact that its assigned point values are harder to be calculated in a casino setting. Moreover, in order to take advantage of it, they need to have solid knowledge of the basic strategy and the rest of the card counting systems. Only dedicated players who have the needed will power and experience can use this method and achieve the desired win. The Wong Halves system is considered to be one of the most complicated strategies that has ever been created. Many players refrain themselves from learning it due to the fact that some of its assigned point values are in fractions which makes the counting of the cards much more difficult. It is indisputable that this system is among the hardest card counting systems of all times and it’s not used by many nowadays. However, it is worth mentioning that it was established by one of the most recognised card counters in the world and as such, it guarantees results like no other strategy. Players can be sure that if they invest time and efforts in it, they will be able to greatly improve their game and most importantly make better decisions for their bets. Wong Halves gives them the unique chance to make accurate predictions of the ratio between the high and low value cards and it enables them to turn the tables in their favour.